Why choose a German shepherd? Congratulations on your choice! As a German shepherd owner, you are in good company – other famous owners of German shepherd dogs including Bob Hope, Roy Rogers, President Roosevelt, and Sigmund Freud. German shepherd dogs are the only dog breed to have the word “dog” as part of their official name. Not many dog breeds have as unique and proud a heritage as the white German shepherd. The breed had its beginnings in Austria in the 19th century when the Queen of Hapsburg reputedly wanted white dogs – to match both the white dresses and white horses used by the family. German shepherd dogs are popular for several reasons – their distinctive appearance, their reliability and their suitability for families. According to the American Kennel Association, in 2016, the breed was the second most popular in the United States – only the Labrador Retriever was more popular. It’s no wonder that German shepherds are so popular – apart from their distinctive appearance, they are also considered to be among the easiest breed of dog to train. Many breeders claim that they are one of the top three most trainable breeds, along with the Australian sheep dog and the Labrador retriever. White German shepherds are also well known for their loyalty and devotion – it isn’t unusual for them to form a strong bond with a trainer or handler. And not surprisingly, entering them at dog shows and obedience competitions can be rewarding – German shepherds enjoy more than their fair share of success. Because the are so easy to train, German shepherds are widely used around the world for various tasks. In France, the are used to track criminals and to search for avalanche victims. Switzerland has a large number of German shepherds in its police force – and in the UK, German shepherd dogs were regularly used by famous Scotland Yard up until the 1950s. Apart from their suitability for law enforcement, German shepherds are used in other lines of work. In 1927, the first Seeing Eye dog was a German shepherd – today, the breed is still the most popular for the job. And the German shepherd is also a great choice for such tasks as herding sheep, pulling carts or acting as a watchdog. However, training a dog can be time consuming, frustrating and hard work – you will need to have patience and a routine. The task of training your puppy will be a lot easier if you begin the process at as early an age as possible – a younger puppy has generally not had the chance to learn too much negative or destructive behavior. Training your puppy should begin as soon as you get your puppy home – and should ideally be undertaken by just one family member. At the same time is is important to make sure that everyone else in the house – as well as any other pets – are comfortable with the new arrival. Unlike some dog breeds German shepherds prefer to live indoors, rather than outside. If possible, bring your new puppy home during a calm time and when you have the time to concentrate on training him. It isn’t a good idea to bring home a new puppy during a hectic time when your routine – and his – will be disrupted, such as holidays or when family are visiting. Try to introduce a new puppy to family members one at a time so it isn’t too overwhelming. When bringing your puppy home for the first time, make sure you are organized. Don’t forget to have food in the house, as well as bowls specifically for food and water. Apart from food and water, you will also need some toys for your dog – if you are bringing a puppy home, it’s particularly important to have something for him to chew on. And your puppy will need somewhere to sleep – many owners find the dog’s be close to them – particularly at first can make training easier. You may want to “puppy-proof” your home, just as you would make it baby-proof. Put any things out of reach you don’t want to be chewed, such as shoes. Some rooms may be off limits and you may want to install a gate across the bottom of your stairs. If your puppy will be outside, make sure the environment is safe and secure and he can’t slip out anywhere. Ensure that he doesn’t have access to such things as paint, medicine and cleaning products. You may want to make a point of showing your puppy that the family eats before he does – and don’t start feeding him from the dinner table, otherwise he will routinely expect that. It’s surprisingly easy to overlook his water – make sure he has plenty and that it’s fresh every day. The first few weeks a puppy is in your home can be hectic – but important. German shepherds live a long time – generally 12 – 14 years, so you and your family have many happy years ahead. When it comes to successful dog training – its important to start early. The first few months are particularly important as any behavior that has been learned will stay with your dog throughout his life. Ideally, this learning process should continue for up to two years. If you are the proud owner of a German shepherd puppy try to begin training as soon as the dog is in your home – just as you would immediately start teaching a newborn baby how to behave around other babies or animals. All family members should learn to handle the new puppy and be comfortable with the new addition to the family, however only one person should undertake most, if not all of the training. Dogs thrive on a routine, so try to have one that works around your job and other commitments. It’s a good idea to introduce a new puppy into your home during a quiet time. Training at this stage should include obedience and hygiene, as well eliminating any bad habits, such as chewing on shoes or begging for food. The first few months in your home are some of the most important to a puppy – many of an older dog’s behavioral problems can be traced back to this period. Experts say that a dog’s experiences between that ages of three and twelve weeks are the most critical and the ideal age to acquire a puppy is at about eight weeks old. This includes getting the animal used to any other pets and family members, as well as house training and teaching you dog to use a lead effectively. And any routines which will become part of your dog’s later life should be introduced at an early age, if at all possible. During much of your puppy’s early training, the two most widely used words will be “no” and his name. You should also make a point of exposing your puppy to different objects, as well as people. Introduce your puppy to such everyday – but potentially scary – things as toys, bicycles, large boxes, and even an umbrella. It’s also recommended to take a puppy for short car rides, letting the window down occasionally. A dog is a lifelong commitment. Begin your training early and you have a better chance of avoiding problems in later life. You will be giving plenty of instructions and commands while training your German shepherd puppy – and it’s important to know how to give them. When training your puppy, instructions should be given in a firm and clear voice – it isn’t necessary to shout or become angry. As mentioned before, German shepherds are considered one of the easiest breeds of dog to train. The breed is also known for its patience and an instinctive desire to please an owner or trainer. They also have a keen sense of timing and admired for their overall agility. It isn’t necessary to give lengthy instructions to your puppy. Most of your instructions will consist of just two words – your dog’s name and the particular command. You will soon learn the importance of being able to effectively give the basic commands to your puppy – come, sit, stay and lie down. You may want to master some of those commands before moving on to the command heel. The secret to successful training is to give your puppy instructions in what you want him to do – and not what you don’t want him to do. Make sure that your commands are realistic and your dog is able to easily and safely carry them out. Never give a command or instruction unless you actually want it carried out. Much of your training should be done with the lead at first, and later without the lead. If your dog doesn’t do what is asked – always correct or discipline him immediately as dogs don’t retain information for more than a few seconds. If you correct him after the fact, he will have forgotten what it is that he was asked to do! The same principle applies when rewarding your puppy. Remember, you are giving your puppy commands and instructions and not becoming angry or impatient with him – with practice, your training will be easy and effective for both of you. White German shepherd dogs are considered to be among the easiest dogs to train, making them particularly suitable for families with pets and children. Once you have chosen your pet, have taken him home and introduced him to your family, one of your next steps is to learn how to “socialize” your dog. Experts consider that the most important socialization period for a puppy begins at around three weeks of age and lasts until around twelve weeks. The period during which a puppy is most influenced by socialization is supposedly between six and eight weeks of age. Regardless of how old your puppy is when you get him, you may well have little or no knowledge of his previous life. Socializing your dog includes various things – getting him used to other dogs as well as other people and also everyday sights, sounds and smells. And you shouldn’t find it too difficult to find friends and neighbors who want to come over to admire your new puppy! Try to bring your puppy home when you can establish a routine and spend some time training him. Socializing is important as it can help to prevent serious behavioral problems in your German shepherd such as aggression, timidity and shyness. A dog that has been exposed to other animals such as cats and horses is better able to interpret their intentions, potentially avoiding a conflict. And a dog that has been thoroughly socialized is less likely to have behavioral problems in the future with other dogs or children. The importance of socialization is such that it can make up an estimated 60% of a dog’s character and temperament. Some trainers even advise that a puppy should meet 100 strangers and visit 50 new places – all before he is three months old. You may not be able to do all that – but it illustrates how important it is to thoroughly socialize your puppy. If you find socialization difficult, you can actually take your puppy to socialization classes – ask at your local vets for details. Try to avoid taking your puppy to training classes that put an emphasis on “punishment” techniques. Simply the act of taking your puppy to the vets is a form of socialization – and it also helps him prepare for future visits. 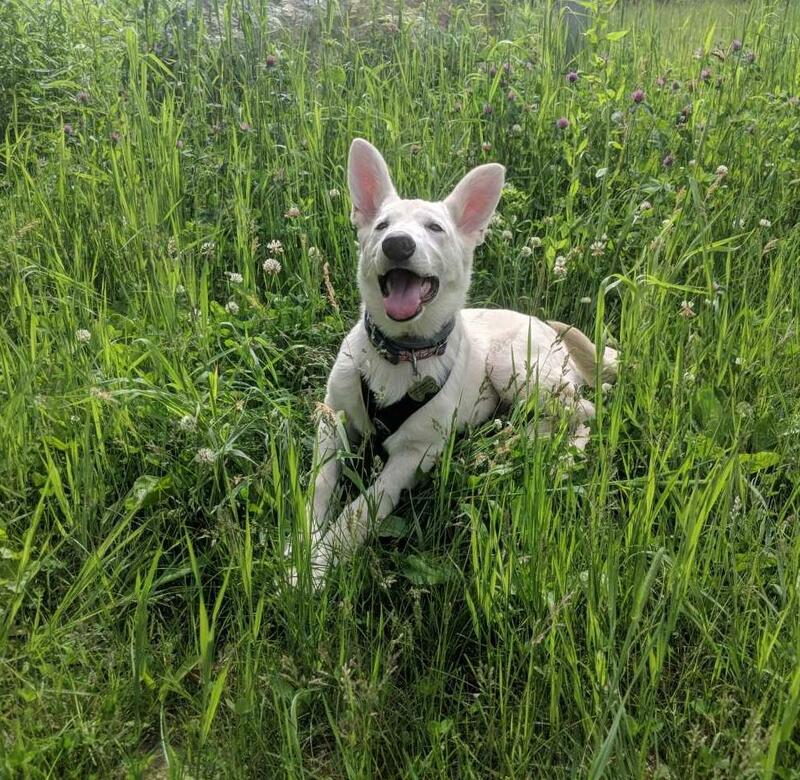 Socializing your puppy correctly can take time and patience – but the end results are well worth it and you will understand why white German shepherds are such a delight to own and train. Socializing your puppy is important and will have a major influence on his behavior – start slowly with socialization training – begin with one on one situations with a friend or neighbor. Work your way slowly to more demanding situations with perhaps several people and pets. Make sure you are in control of the situation – the object isn’t to frighten your dog, simply get him used to things. Try to ensure that your puppy meets different types of people – young and old, loud and quiet. If your puppy encounters people of a specific appearance – for example, young girls – he may be fearful or aggressive when he later encounters other types of people. If you don’t have small children in your home, try taking your puppy to a park or playground. Try to avoid taking your puppy to areas where unvaccinated dogs may be found, unless your puppy has had all its shots. You may want to deliberately walk where you may encounter other dog walkers – or even arrange for a friend to walk their dog at the same time. Your puppy should be exposed to different objects, as well as people – things that we all take for granted. Introduce your puppy to such everyday – but potentially scary – things as bicycles, large boxes and children’s toys. You should also take your puppy for short – and then longer – car rides, letting the window down occasionally. You should also expose your puppy to things that make noises or move quickly. Try exposing your puppy to such everyday things as the vacuum cleaner, washing machine and doorbell. Start out slowly until he has got somewhat used to these things – for example, leaving the vacuum out before switching it on. If you live in the country, or on a quiet street, take your puppy to a noisy or crowded area. Likewise, if you live in the heart of the city, take your puppy to the countryside or to a farm to experience such strange creatures as hens, ducks and cows. Don’t let your puppy chase other animals during this time. A small puppy treat makes an appropriate reward when socializing your puppy. At first you can reward him every time you meet another person; then progress to the point where you are rewarding without treats. “Sit” is one of the most basic – and important – commands that you will teach your puppy. Typically, a puppy is ready to learn this command at eight weeks old. And you will also discover that it’s one of the most difficult commands to enforce – as puppies of course, tend to be naturally playful. The good news is that even the liveliest puppy can be successfully trained. You should train your puppy to obey these commands before any others. Begin your training in a quiet part of the house with no distractions. Some trainers suggest training by the front door – a puppy who sits easily by the front door is more manageable when you have visitors. Try to limit each training session to around 15 minutes and be sure to use a firm tone of voice and offer praise and reward when he gets it right. To successfully train your dog to sit, you may want to have him on a lead at first and then progress to training without the lead. Once you have given him the command to sit, gently help your dog to sit by folding his back legs under his bottom – repeat this as necessary until he gets the idea. The command “stay” is often used in conjunction with “sit” and will help you control your puppy when it’s necessary. Once your puppy has learnt to sit, practice walking away while giving the command to stay. If he gets up before he has been told to, you should persuade him to sit again, by using the technique above. You should gradually walk further and further away, leaving him to stay for longer periods – in general, it takes a week or so to train a puppy to sit and stay for a couple of minutes. After a few months it should be possible for your puppy to stay while you leave the room, for a period of around 15 minutes. You can also use a hand signal to instruct your puppy to stay, for example a raised hand. At first, this should be done using the lead; then you can progress to doing it without the lead. Once your puppy has got used to these commands, you should be able to command him to sit and stay, by using hand signals alone. With a little patience, your puppy will soon master these basic commands – making for a better relationship between the two of you. Generally, you can start to teach your German shepherd basic commands once he has reached the age of six months. Try to have everybody in your family take part in these lessons – everybody will need to use the commands at some point – and keep lessons short, ideally around ten or fifteen minutes. As with other aspects of training, you should reward your puppy with affection and perhaps a treat when he does well. If he isn’t learning quite as quickly as you had hoped, then you can withhold the reward. Don’t punish your dog for not obeying these commands – he will then associate that particular command with punishment. All the commands that you give your puppy at this stage should consist of just two words – your puppy’s name, followed by the command – “Meadow, come!” When giving commands to your dog, make sure that you use a tone of voice that’s both firm and enthusiastic. Be sure to praise your puppy when he gets it right. You should start training your puppy to obey the word “come” just as soon as you have brought him home the first time. To train your puppy to come, you should use the lead at first. Extend the lead distance as far as it will go and then use the command while at the same time tugging gently on his lead. If you don’t see positive results at first – persevere. Make sure you are crouched down on the same level as your dog and are using the word “come” in a positive, firm way and not angrily. Praise and reward your puppy – don’t be cross if he doesn’t get it right the first time. After he has got the idea, take the lead off and repeat the procedure. To train your puppy to lie down, first command him to sit. Lower one of his favorite food treats between his front paws and say “down” or “lie” – most dogs will lie down to get at the treat. Once he is lying down, you can then give him the treat. Try to practice the command lie down from different positions – from both a standing and a sitting position. Dogs tend to lie down in two different positions – “flat” where the hips are rolled and the legs are to one side; and “sphinx” in which his hind legs are tucked underneath. Training your dog to lie down helps to show him who is in command – it can also be helpful in a busy or dangerous environment. And a puppy that’s lying down is usually a quiet puppy! One of the supreme tests of obedience is to train your puppy to heel. Heeling is the act of walking with your dog close beside you – paying attention just to you and not being distracted by anything else. Once you have trained your puppy to do this, it’s an easy and safe way to walk through crowded or unfamiliar places with your dog. Ideally, you should first train your dog to sit on command before you start training him to heel, and you should use the lead at first. You should begin training your puppy to heel in a quiet room, with minimum distractions – a long hallway or corridor is ideal for this – and you should not lead him to the door or outside at first. Begin your training with your puppy sitting on your left side. (Assuming that you are right handed) Hold the lead in your right hand, but hold the lead close to your dog’s collar with your left hand. Start to walk slowly, using your dog’s name and the command to heel. Remember, while training, most of your commands will consist of just two words – the command and your dog’s name. Give your commands in a firm authoritative tone – don’t become angry with him if he doesn’t get it immediately. Try to keep your puppy close to you and once you have gone a few steps, you can reward him with a treat. If he starts to move away from you, a short sharp tug on the lead will get him back at your side. Once you have done this a few times, you should be able to walk further with your dog by your side – eventually without using the lead. Twenty paces is a realistic goal. Once your puppy can walk to heel, the next step it to train him to turn around when you turn. To turn with your dog, put your hand on his collar while you turn and give the command to heel – again, practice with the lead on at first, then off. Puppies can be lively and playful and you may not find this training easy. Persevere and the end result will be well worth it. A puppy that runs to retrieve objects is not only getting physical exercise – he is also getting mental stimulation. Playing fetch and retrieve is a chance for your dog to get some exercise as well as practice his instinctive hunting skills. And throwing and fetching objects can also keep children happy for quite some time! Before you are able to train your dog to run and fetch objects, you must first train him to hold objects in its mouth. Don’t use squeaky toys for this – as your dog will then want to chew them! While training your puppy to hold things in its mouth, reward with verbal praise and physical praise, rather than treats. Most puppies will learn this fairly easily and quickly, although with other aspects of training, it depends on the animal and how much time you can devote to it. German shepherds are not generally selectively bred for retrieving, although they can easily be trained. As with other aspects of training, things may not always go smoothly. If your puppy is reluctant to fetch, try to get him excited by throwing a squeaky toy and running with it yourself. If your dog seems reluctant to bring the object back to you, you may have to continue working on the command to come. If your puppy runs to the object but doesn’t pick it up, you may need more lessons on the command to hold. And the same applies if he picks it up but then continually drops it while bringing it back – make sure your puppy is proficient at holding objects before you begin fetch and retrieve training. It’s an easy thing to overlook – don’t give your puppy items to retrieve and hold that are too big to comfortably fit in his jaws. Your puppy may bring the retrieved object some of the way back to you – but doesn’t quite understand to bring it to you. One solution to this is to say “no” firmly, then retrieve the object yourself and bring it the rest of the way back. And some dog owners say that if your puppy watches other dogs fetch and retrieve, he will get the idea. Training your puppy to fetch and retrieve can give you and your puppy hours of fun – but don’t force it. Some dogs just seem to enjoy it more than others. While training your German shepherd, you will soon realize the importance of offering rewards for good behavior or for learning something quickly. German shepherd dogs are quick to learn, are reliable and obedient – and it isn’t unusual for them to form a strong bond with their trainer. Rewards actually fall into three basic categories – verbal praise, treats and physical contact. You may find that your dog is motivated by one, rather than the other. In this case, physical contact would mean stroking your puppy. Be sure to give him long strokes along his body, rather than patting him on the head – which your dog may see as a dominant gesture. It’s a natural thing to want to use treats as a reward during training – but you should be careful not to overfeed your puppy. Many treats are actually rich and fairly unhealthy. If you are using treats as a reward, one solution to overfeeding is to make sure the treat is part of your dog’s daily food allowance. Try not to use treats as a reward for your puppy all the time – over time you should gradually start to praise good behavior instead of rewarding with a treat. Eventually, during a training routine, you should offer the treat as a reward every other time, and then every 2nd or 3rd time, and so on. Your puppy will need constant praise and encouragement while being trained – it’s a good idea to keep some treats easily accessible. If you are walking or playing outside, keep them in a pocket or backpack somewhere you can easily get to them and then immediately give them to your puppy. Good timing is also essential when you give your puppy a reward – you must offer the reward at the same time that the dog has done whatever you commanded, or at least within a few seconds. Dogs are only able to retain information for a few seconds. If you reward your dog for sitting, but he has already stood up again – he won’t quite get the message. Some effective – but humane – methods of disciplining your dog are as follows. A puppy that misbehaves can be isolated from the other people, for no longer than a few minutes. A squirt with a water pistol (filled with water or lemon juice) can be an easy way to stop a dog in its tracks. And a stern and commanding voice, along with the word “no” sometimes works best of all. If you are training your puppy to do something, such as sit or come on command and he is a little slow, repeating the exercise several times from the beginning may also help to reinforce the message. While training, use a firm but enthusiastic voice and offer rewards when applicable – you may find you won’t need to use discipline much at all. It is of course, one of the most indispensable items you will have when it comes to training your new puppy – his leash, or lead. A properly used leash ensures your dog’s safety as well as the safety of other animals and people. In fact you should never allow your dog to run free unless you are in an enclosed and protected area – you may even have leash laws in your neighborhood. You should actually use two types of leash for training – a long houseline with a bolt snap for indoor training, and a standard leash for outdoor use. Collars come in different styles and colors – a well-fitting collar should allow you to slip two fingers underneath it with comfort. If you are choosing a collar and leash it’s a good time to make sure you have identification on your puppy, too. Most dogs – particularly German shepherds – don’t have a problem wearing a collar and leash, although some dogs take longer than others to be completely comfortable. If your dog seems a little bit slow – it doesn’t mean he is any less intelligent, he just needs a little more time. Start out by simply training your puppy to be comfortable with the leash. Let your puppy smell the leash and inspect it. Have your dog wear his collar and leash while eating, over a period of a few days – this way, your dog associates his leash with the somewhat enjoyable task of being fed. During this time, the puppy’s leash should just trail on the ground. After a few days of this routine, you can start to lead your dog around the house while he’s wearing the leash – then repeat the exercise outside. Gradually begin to walk longer and longer distances – ideally, in a quiet environment with few distractions. Your dog’s leash should not be too long – between four to six feet is ideal. Some dog owners think the retractable lead is a wonderful thing – this type of lead lets your dog roam up to 30 feet away, but still be under your control. However, be careful when using the retractable lead alongside busy roads. One of the problems you may encounter with a boisterous puppy is that of climbing up the lead or trying to jump on you. Train your puppy not to do this by saying “no” firmly and moving away or commanding your dog to sit. If necessary, repeat the exercise that you were practicing before he started jumping. One of the biggest challenges you may face while training your German shepherd to use a leash is that of pulling on the leash. If your puppy does this, he may be excited or bored. Try praising him if he remains at your side. Keep the leash loose at all times – if your puppy starts to run off, abruptly change direction so that he’s suddenly behind you. If your puppy is pulling on the leash, don’t pull him all the way back again – give a quick tug and then immediately release and make the leash slack again. With a little bit of perseverance, you’ll find that your puppy is comfortable with his leash – after all, most puppies usually love to have their leash put on as it means they are going outside! Perhaps one of your most important considerations will be successfully training your new German shepherd puppy to interact with other people – especially if you are bringing your dog home to a large family. Fortunately German shepherd dogs are not only easy to train – they make an excellent choice for a family with children or pets, as they generally get along well with both. As with all aspects of training, try to begin this training when your puppy is less than four months old. These first few months are particularly important as any behavior that has been learned will stay with your dog throughout his life. This process should continue for up to two years. Training your puppy to comfortably interact with people, other animals and situations is known as socializing your dog. Socializing is also important as it can help to prevent serious behavioral problems in your German shepherd – such as aggression, timidity and shyness. A puppy often barks at strangers – this is actually your dog’s way of protecting or warning you. Try to get your dog as familiar with strangers as possible by introducing him to people who call at the house and having them give your puppy a treat. If this is still a problem, you may have to leave blinds or curtains closed to eliminate distractions from outside. German shepherds tend to be dependable with children, however you should still exercise caution. Babies tend to figure largely in a puppy’s life – if you have a baby or toddler in your home, its important to make sure they get used to each other. You should allow your puppy to inspect the baby, but hold him on the leash when you do it the first time. Never tease a dog with a baby. Young children can be almost as challenging as babies. A puppy just can’t help joining in if there’s a group of small shildren running around and playing. Playing is acceptable, but make sure your children don’t tease you puppy – teasing a dog is actually the major cause of children being bitten by a pet – take it seriously if your child is jabbing or sticking fingers into the dog’s face. Older children are better with a puppy – the ideal age for a child to have their first dog is between the ages of 8 and 12. You’ll soon discover that even the most responsible child generally need some reminding to help look after their puppy. Children this age actually make excellent trainers for a puppy – they tend to lack the self-consciousness of adults and are of course, learning themselves. Aggression towards people is an extremely difficult thing to correct. German shepherd dogs are known for their placid nature and their ability to bond with people, so you may never have this problem. To effectively deal with an aggressive dog, you first have to try to determine why he is aggressive – he may be frightened or being teased. Fear biting is a possible symptom. Training your puppy to interact effectively with people can be hard work – fortunately you have one of the friendliest breeds that there is. Training your German shepherd to interact with other animals can be a challenge, as most dog owners know only too well. However, German shepherd dogs are considered to be one of the easiest dog breeds to train – they also tend to get on with other animals and people particularly well. Try to create a relaxed atmosphere when you bring a new puppy into your home for the first time – it’s all too easy to have a frantic environment which just makes the dog excitable. Your puppy will find himself the center of attention – and it’s easy to forget the basics of training him. You will find it easier to get a puppy used to other animals and people – socialized, as it is known – if your puppy is less than four months old. A puppy that’s older than four months may find it difficult to fully socialize with other animals – and you may find it more difficult too. Once the animals have all inspected each other, you can allow the puppy to walk around the room with the cats – be sure to keep an eye on all the animals. If your puppy chases the cats or barks at the cat, a firm “no” should persuade him not to do that – you may also want to give him something to chew on. After a few weeks of this, your dog and cats should be able to live together peacefully. Another effective way to achieve harmony is to put a small piece of the other animal’s bedding near the place where your puppy will be sleeping. A new puppy is far more likely to accept the other animals as harmless family members if he first becomes accustomed to their smell. If you are walking your puppy, you may have trouble when encountering other dogs. A puppy that has been socialized – exposed to other dogs, people and things – will generally have fewer problems in this respect. You should start getting your puppy used to the other dogs just as soon as you can, by taking him to parks, playgrounds etc or allowing people with dogs to come and visit you. Fortunately, German shepherds are well known for their ability to get on well with most other animals – so you should have no serious problems achieving a peaceful environment for all your pets! Once you have your new puppy home, one of your most important considerations will be house training your puppy. As with most other aspects of puppy training, its best to begin as early as you can – expect the training to be complete only when your dog reaches six months old. Nearly all dogs respond to house training fairly well – the German shepherd is one of the most receptive breeds. Perhaps the first thing you need to know is how frequently your puppy may need to go. On average, a three month old puppy needs to urinate every three to four hours, while a puppy that is five months old urinates every four to five hours. Generally speaking, as a dog grows older, it can go that much longer before having to urinate. There are certain signs that your puppy may need the bathroom – after a while, you will be able to spot them and anticipate. If he suddenly puts his nose down and sniffs intently, it’s usually a signal. Your puppy may appear agitated, or begin to whine or pace if he needs to go. He may also run behind a piece of furniture, squat down or raise his leg. If your dog urinates in the house when left alone, this is actually a form of separation anxiety. It’s caused by stress – and the dog usually does this shortly after being left alone. One solution is to train your puppy to feel comfortable with his crate and to leave him there – the problem may go away after a few weeks or months. Other than that, try to leave your dog alone as casually and with as little fuss as possible. One of the biggest problems for a dog owner is the dog who goes to the bathroom in the house – but won’t go outside. There may be several causes of this: a dog that has been confined indoors for at least a month has simply got used to relieving himself indoors – he doesn’t know any better. If your dog goes to the bathroom indoors, rather than out, make sure you are taking him outside as often as he needs. A puppy should be taken outside several times a day – immediately after waking, and after eating or playing. While walking your dog outside, try to be alert to any signs that he needs the bathroom. If your dog has an accident inside the house, immediately and thoroughly clean the area so your puppy won’t assume that spot is where he’s supposed to relieve himself. And if your dog goes in an approved spot in your yard or outside – leave the droppings there, if practical. The next time your puppy sniffs that spot he will be encouraged to do his business there. House training may not be the most glamorous aspect of training your puppy – but as most of us would point out, it is one of the most important. All dog owners are going to have a problem with unwanted barking or howling at some point – although German shepherds are easier in this respect than many other dog breeds. In fact, a lot of German shepherd owners firmly maintain that their dog only barks when absolutely necessary! To deal effectively with barking, you first need to determine why the dog is barking. A puppy barks for several reasons. He may need exercise or he may need to use the bathroom. He may simply be bored and need attention. And some puppies bark because they are excited or there’s just too much going on around them. A bored dog tends to bark a lot. If you feel your puppy is barking because he’s bored or neglected, try not to give your dog attention as soon as he starts to bark. By doing this, you are then saying that it’s acceptable to bark and that barking leads to a positive thing – your attention. Instead, you should make sure your dog is getting enough attention when he’s not barking. Your puppy may bark if left alone for too long – although you might not know this unless the neighbors tell you! If you do have to leave your puppy alone, make sure he is exercised before you leave him and that he has plenty of water. Some owners even advise putting music on for the puppy. If your puppy barks for no other identifiable reason, he may simply need to go to the bathroom. On average, a three month old puppy needs to urinate every three or four hours, while a puppy that is five months old urinates every four or five hours – as he gets older, he will go less frequently. A dog shouldn’t be punished for too much barking or howling – which is after all, an instinctive thing. Any action you take to stop a dog barking must be undertaken at the time that they are actually barking – and not sometime afterwards. Dogs are not able to retain information for more than a few seconds. If your puppy is barking for no apparent reason, simply try silencing him with a firm “no”. If you are desperate, you can purchase a “no bark dog collar” manufactured by several different companies. When your dog barks, it triggers a harmless spray of lemon liquid which supposedly stops the dog from barking. The disadvantage of the collar is that most dogs are to clever – they will sooner or later learn to bark without the spray affecting them. An alternative to the spraying collar is the shock collar. As the name suggests, this device triggers a mild electric shock whenever your dog barks. The shock collar is completely humane and most experts consider it to be generally more effective in stopping barking than the no bark dog collar. A puppy that barks too much can certainly be annoying. But keep in mind there may be occasions when you want to hear your dog barking – noises outside in the yard, or a smoke alarm, for example. After all German shepherds do make excellent watchdogs. Biting and chewing may be annoying to us sometimes – but they are perfectly natural activities for your puppy. A puppy that bites does so instinctively and has probably learnt to do so from his siblings – over time, your puppy will outgrow this behavior. However, there are some steps you can take now. Biting is most common with young puppies – although most young puppies do not bite often, and if they do, something has caused them to bite. Ideally, a puppy should be trained not to bite before he is four months old. Normally, a puppy learns not to bite from his mother or other puppies – if he is an “only dog” he learns from his owner. Many people think puppies are just playing when they bite, but in fact puppies can bite for several reasons. They may be teething – puppies teeth for about a month, usually at four months old – or trying to strengthen their fairly new jaws and teeth. A puppy that bites may be exploring, or trying to compensate for an unbalanced diet – or he may be just bored. If your puppy is biting due to teething, the good news is that he will outgrow this. You can also buy toys designed specifically for teething dogs that help soothe the discomfort. A puppy may also be biting because he doesn’t get to bite enough while eating – in this case your puppy will appreciate a nice bone. Chewing is also a common problem with puppies – be prepared to deal with your puppy chewing as soon as you bring him home and have plenty of chew toys in your home and ensure they are accessible. Some trainers recommend having up to 20 different chew toys available and rotating them periodically, to add an element of surprise and to keep your puppy interested. As with biting you shouldn’t punish your puppy for chewing. Instead, you should gently remove the object and substitute something he can chew on – such as a chew toy. Be sure to praise your pup for using the chew toy. German shepherds are well known for being easy to train and communicate with. However the breed is particularly prone to what is sometimes called fear biting. Fear biting also sometimes results from having been ill-treated or from inadequate socialization of a puppy. A fear biting dog also often suffers from low self esteem, is often nervous or apprehensive and can frequently cower when introduced to strangers. You may need to get a professional to help train your dog to overcome fear biting, but there are some steps you can take. You need to gradually expose a fear biting dog to the things that he’s afraid of. It’s rather like the process of socialization all over again. Another technique you can try is to have a friend walk away from your dog with a dog treat and hold it out in the palm of his hand. The dog should be allowed to walk up and take the treat, and you should gradually progress to eye contact, verbal praise and stroking the dog.